Turcat, who served in the French air force as a transport pilot and later as a test pilot, is perhaps the airman most identified with the 100-seater supersonic jet. He was a graduate of the prestigious Ecole Polytechnique, the most selective French Grande Ecole (though his grades limited his options when he left the school and he “accidentally” opted for a career in the Air Force). Towards the end of World War II, Turcat joined the (Free) French Air Force and, in 1947, became certified as a pilot. He was quickly noticed for his flying abilities, notably on board the Dakota C-47. After serving in the Indochina War, he graduated as a test pilot in 1951, tested for the Air Force and later for Nord-Aviation, flying the Nord 1500 Griffon II (a supersonic scram-jet aircraft) and later winning the Harmon Trophy for his feats in 1958 with that aircraft. In 1962, as the Concorde programme was starting, Turcat joined the state-owned Sud-Aviation. He went on to become Concorde’s first test pilot as well as the company director of flight testing. On March 2 1969 he flew Concorde on her maiden flight and on October 1 1969, he took her supersonic for the first time. This was the beginning of a great era for Turcat (who instantly became a household name in France) and for the European aerospace industry more generally as Concorde was developed out of the Anglo-French collaboration between Aérospatiale and the British Aircraft Corporation (BAC). Concorde demonstrated significant technological progress, on wing design notably and also on engines, flight controls and avionics. Air compression at Concorde’s high speeds of travel also posed material and structural challenges leading to potential fatigue issues and to the expansion of the aircraft body and structures, which needed to be addressed. At take-off, the rotation from flat to a steep 18 degrees also meant significant stress on the wing structure and on the landing gears. The aerospace industry made a monumental leap forward with this aircraft. Speaking in 2009, Turcat said his March 2 1969 flight marked “a significant acceleration in the history of (civil) aerospace”. The interest of other nations, in particular America and Russia, was piqued by this early European technological success – it challenged them, as did the emergence of Airbus in later years. Sadly the technical success that was Concorde did not translate into commercial success, though it laid some of the groundwork for the establishment of the modern industrial giant Airbus, through Aérospatiale notably, which had worked alongside BAC to build Concorde. Aérospatiale was also engaged with Deutsche Airbus, which eventually led to the constitution of the “Airbus economic interest group”, with Hawker Siddeley and Fokker, in 1970. Concorde’s economics were also problematic, making assumptions on fuel costs that were later dispelled by the 1973 oil crisis. A supersonic Concorde consumed more fuel but could also fly more sorties; this economic model was viable only while fuel costs were a smaller component of the overall operational costs. Concorde’s first operational flight took place in 1976 (certification was granted on December 4 1975) but by February 1973, most airlines who had expressed an interest in acquiring it had cancelled their orders. In the end British Airways and Air France were the only two airlines to take them on – and then only with government subsidies. The Americans also objected to the aircraft – mainly on environmental grounds. As a result Concorde had a limited, if prestigious, career. On April 10 2003 Air France and British Airways announced Concorde’s retirement and the great supersonic aircraft completed its final commercial flight on October 24 2003. As Concorde started its career in 1976, Turcat was in the process of writing his first book: Concorde: Essais et Batailles and ending his flying career. He was also preparing for his future as a politician, in local government in Toulouse and, as an MEP in Europe. Following his retirement from the aviation sector, he went back to university, obtaining a PhD on Christian art in 1990. In his later years, Turcat was always keen to talk about Concorde and came out of retirement to defend the aircraft and its designers after the 2000 crash in Gonesse, France, but he was also personally very shaken by the accident and the loss of the aircraft – and depressed at the outcome of the inquiry. 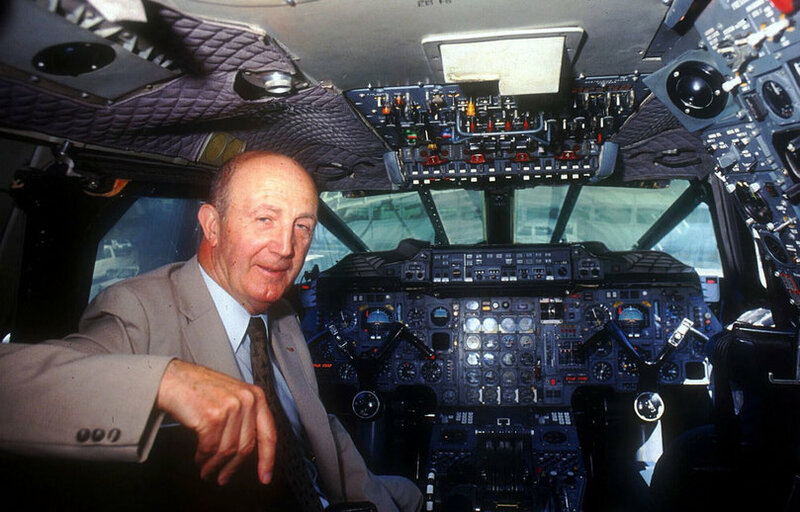 It is undeniable that the life of André Turcat and the technological history and prowess of Concorde are closely intertwined. It is also clear that his passion for technology and Concorde echoes that experienced during the formative years of the programme in France and in Britain, with the renewed pride and heritage that came with it. Source: The featured picture is taken from www.leJDD.fr.